Ever thought of being like Robinson Crusoe where you get to be on your own personal island? This quaint homestay in Kerala lets you do just that. 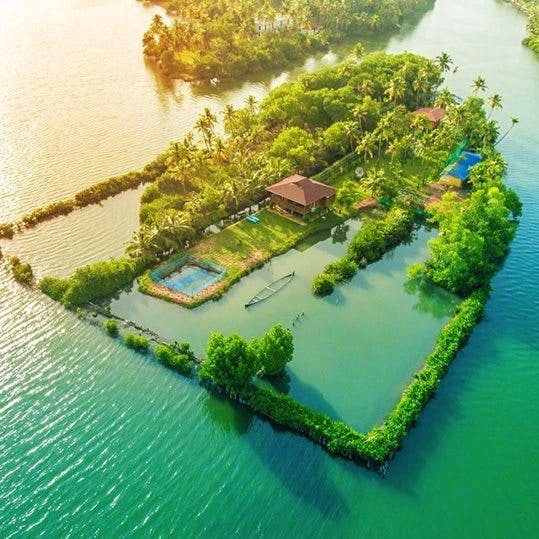 Located on Kerala backwaters, Vini’s Farm is a charming stay on a tiny island on the convergence of the Kallada River and the Ashtamudi Lake. The breathtaking villa has wooden cottages on stilts equipped with mod cons and lush rain-fed greenery. The two rooms with attached bathrooms have stunning views of the lake. You can book the whole villa and have the island to yourself. There's a lot to do, actually. Explore the backwaters on a sunset cruise on a vallam (country boats) or take a cruise through the narrow and winding canals with backwater villages all through the route. You can also go fishing. The backwaters offer good opportunities for birdwatchers--kingfishers, egrets, herons and many other species of birds can be seen here. You can also ask for a cooking class from their chef and pick up rudiments of local cuisine. But, if you want to jut let your hair down then there's nothing better than lounging on the verandah or under the coconut trees with a book. You could also star gaze thanks to a clear pollution-free night sky. The quiet offers an ideal setting for writers and artists. The Island is about 25 kms from Kollam town. You will have to take a ferry to get to the island. From Trivandrum International Airport, it is about 84 kms. There is also a train station called Mundrothruthu but very few trains stop here. With October to May being the best time to visit here, this one makes for an awesome winter vacay, far away from the hustle bustle of the touristy crowd. Prices start from INR 14,900 and INR 1,500 for per extra person.